I think it is fantastic to share our love for food even we don´t belong to the same country or don’t speak very well the same languageas happen with me but i like very much to share my recipes. Thanks for the review. I met you at 5 star Foodie, but I’ll come back. I took a look at your blog and it’s great! I will be sure to try some of your recipes. Thank you for coming to visit my site. I hope you’ll come again soon. Thanks for the introduction to okonomiyaki – had no idea about any of this stuff. Am now keen to try!! 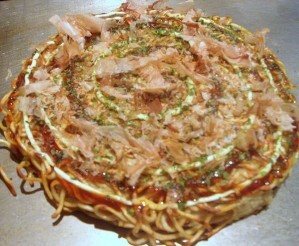 I’m a huge fan of okonomiyaki, and I’m heading over to 5 Star Foodie right now to check out your guest post. Congrats on being invited to do that! I agree with Portuguese flavors, too, that it’s wonderful how the Internet allows people to share across borders and divides in a love for food (or anything else, for that matter). Hi Gastropub Girl, I’m delighted I could share this with you. Do go try it if you get a chance. I think you will like it. Hi Sapuche, Thanks for checking out my post. Yes I think it’s fantastic we all get to share our food stories, news and ideas. I have also learnt so much from reading your blog!